Monarch butterfly. Photo: Alan Vernon.Have you seen National Geographic’s Great Migration series on TV? I’ve been amazed by those animals’ innate ability to navigate across huge distances. But great migrations aren’t just the stuff of African plains and the open ocean. There are amazing organisms migrating through the Bay Area right now! As you read this, monarch butterflies are arriving at their winter homes in Santa Cruz and Pacific Grove. Beautiful black and orange monarchs spend their summers dispersed across North America. At the end of the summer, they embark on a journey of over 2000 miles from their summer homes to their winter havens. 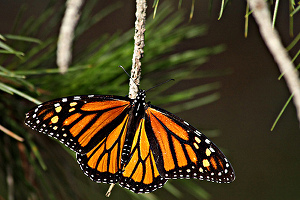 Monarchs that live west of the Rockies come to the Monterey Pine and Eucalyptus groves along the California coast, and monarchs east of the Rockies overwinter in forests in the mountains west of Mexico City. These individuals are long-lived, with a lifespan of about 7 months. They fly south and then hunker down, hanging from trees in clusters and basically sleeping. With spring’s longer days, the butterflies awaken and fly back north. However, the return trip is not made by the same butterflies that flew south in the fall; instead, the trip is made in stages by their children and grandchildren. Their great (or great-great) grandchildren head south again at the close of summer, never having made that trip before. Monarchs make this long journey by using the sun as a compass. But the position of the sun changes each day, so the monarchs use a circadian (24-hour) clock to compensate for the daily change in the sun’s position. Scientists used to think monarchs’ circadian compass was in their brain—now we know that the compass is in their antennae. You can see the overwintering monarchs yourself: The Pacific Grove Museum of Natural History offers daily tours of the Monarch Grove Sanctuary, just a few miles from Monterey. The museum hosts a special event, Monarch Magic Science Saturday, on November 27. It includes a lecture series about monarchs, butterfly arts and crafts, and a plant sale—you can purchase nectar plants, which provide food for adult monarch butterflies, and milkweed plants, which provide food for the monarch caterpillars. Put these plants in your garden, and maybe you can convince some migrating monarchs to take a detour through your backyard. Monarch butterflies aren’t the only animals that migrate through the Bay Area: check out The Great Migration, a QUEST TV story about birds traveling along the Pacific Flyway.